A Thai street food classic, Pad Thai. Made with traditional Thai spices, and our konjac shiractaki Miracle Noodles, your taste buds will feel transported straight to Thailand. 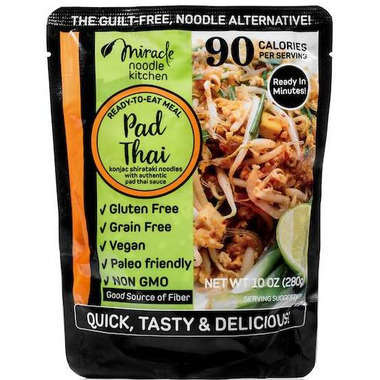 Made with shirataki noodles, these are the perfect replacement for regular high carbohydrate noodles and pasta. 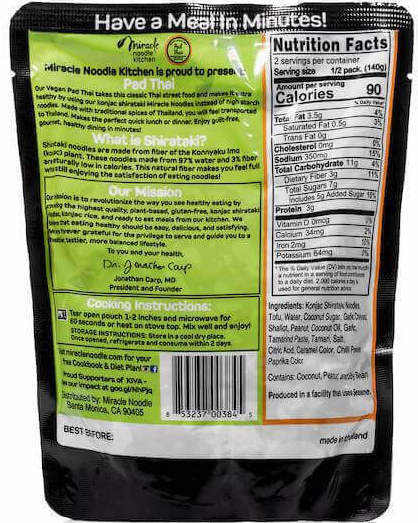 Ingredients: Konjac Shirataki Noodles, Tofu, Water, Coconut Sugar, Garlic Chives, Shallot, Peanut, Coconut Oil, Garlic, Tamarind Paste, Light Soy Sauce, Salt, Citric Acid, Caramel Color, Chilli Powder, Paprika, Color. Not a good flavor at all! Awful. Really awful. The tofu was tough. The sauce was awful. Had to throw it out. Tofu is tough, sauce is runny... not my favourite. This is actually a package of miracle noodle porridge. Disgusting. I love how you can just microwave and eat. The noodles are not high carb noodles either. Great!